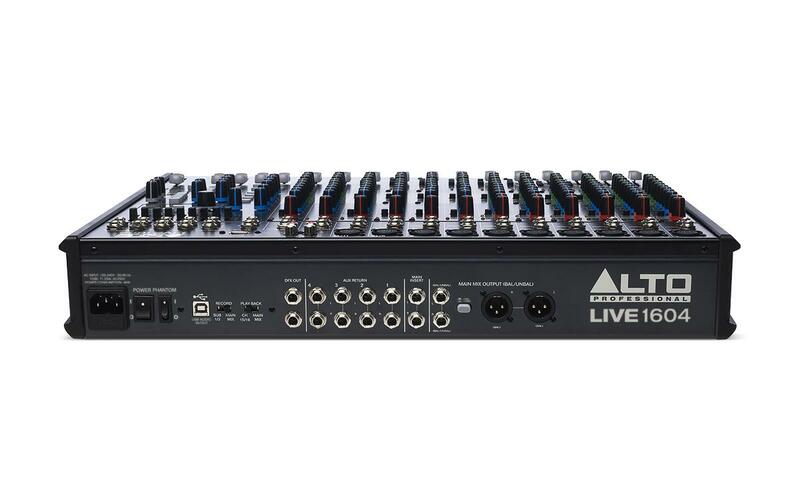 The Alto Professional Live 1604 is a professional 16-channel, 4-bus mixer with all the tools you need to create the perfect mix, whether it be a small acoustic gig to a large rock concert. With flexible routing options and loads of onboard DSP tools, Live 1604 fits the demands of nearly any live performance environment. It features 10 balanced XLR inputs with switchable phantom power, 3-band EQs with sweepable mids for additional tonal shaping, four aux sends per-channel for monitoring and external effects, and a 9-band graphic EQ for main or monitor outputs. The Alto 1604 is also equipped with a headphone jack with an independent level control which enables additional monitoring and mixing. 60mm faders with LED meters provide precise control and visual feedback for accurate, hands-on mixing. The perfect 16-channel for any sized live show.